Behind the wall of an old bookshop, curious young mice gather for university. There, a student named Pete approaches the professor with a plea: help me learn about my ancestor and the treasure he lost beneath the Atlantic. It’s enough to pique the once intrepid, now merely scholarly, mouse’s curiosity; he gets busy helping young Pete trace his clues. The truth surfaces: to access his family’s treasure, Pete will have to go where no mouse has gone before—to the ocean floor. He experiments with diving bells; he and the professor visit the aquarium to conduct scientific research and to design their submarine. The book’s illustrations draw from a muted palette that seems to brighten as the adventure advances. They opt for soft lines but are rich with eye-catching details and make excellent use of scale, placing the adventurous mice against grand backgrounds in wonder-waking ways. The mice use human instruments and flip through the bookstore’s books during their research; they experimentally dive next to rubber duckies in the tub. Pete slouches in a schoolboy cap, the professor sports a regal mousetache and often clasps his lips around a curved pipe. A cat lazes in a captain’s hat, and a whale issues its mournful call above the fish-shaped submarine. At points during the mice’s experimentation and preparation, images take over the storytelling; they are thrilling and expressive enough to operate without words. Lessons work their way into the text. These mice are not daunted by their size or by size of the world around them; when X marks the spot deep on the ocean floor, it’s simply a starting point. The book’s sketches celebrate technology and invention—in service of Pete’s captivating adventure, yes, but also in ways consistent with Kuhlmann’s previous, celebrated titles, Lindbergh and Armstrong. 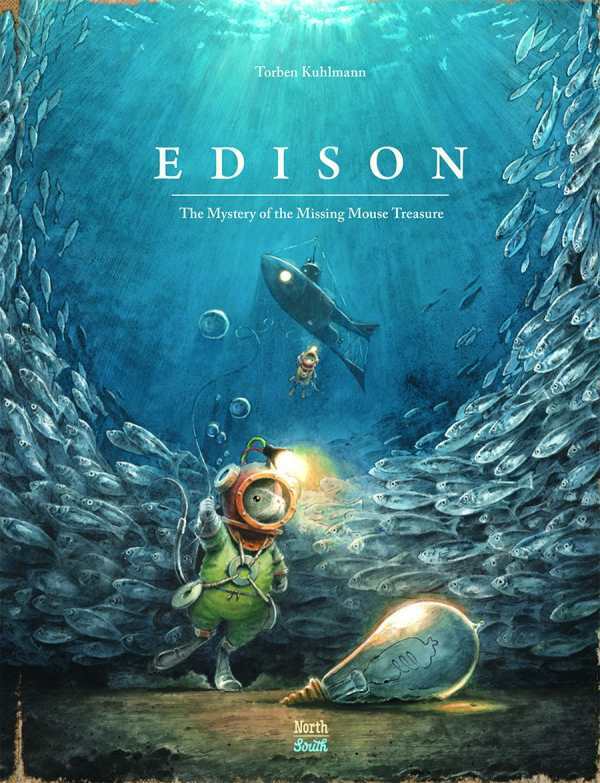 Edison is a beautiful and inspiring tale about two tiny creatures who refuse to belittle themselves by accepting the limits of “Never!” and who are awarded with history-shaping truth for their efforts.